In a 6-3 decision today, the US Supreme Court held that detaining motorists on the side of the highway to await the arrival of a drug dog violates the Fourth Amendment's proscription against unlawful searches and seizures. 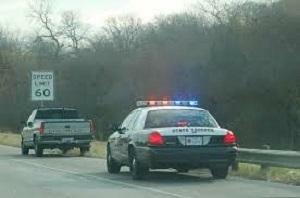 In the decade since the Supreme Court held in Illinois v. Cabellas that a drug dog sniff of a vehicle that did not extend a traffic stop was not a search under the meaning of the Fourth Amendment, law enforcement agencies across the country have routinely detained drivers on the roadside awaiting arrival of a drug dog, then used drug dog alerts as "probable cause" to allow vehicle searches. The practice left motorists in a legal limbo where there was no actionable cause to detain them, but they were not free to be on their way. Today's ruling from the Supreme Court says that is not okay. Writing for the majority, Justice Ruth Bader Ginsburg noted that police may request drivers licenses, vehicle registrations, proof of insurance, and check for outstanding warrants because all those investigatory actions are aimed at enforcing traffic laws and ensuring that vehicles are operating safely -- the ostensible reason for the stops. Prolonging the stop, even for a few minutes, to allow for the arrival of a drug dog was improper, Ginsburg wrote. "A traffic stop becomes unlawful if prolonged beyond the time in fact needed to complete all traffic-based inquiries," Ginsburg said. The ruling came in Rodriguez v. US, in which Dennys Rodriguez had been pulled over in Nebraska for a traffic infraction. He was issued a warning ticket for driving on the shoulder of the road, but then made to wait on the roadside for the arrival of a drug dog 10 minutes later. After the drug dog alerted, his vehicle was searched, methamphetamine was found, and he was charged and convicted. While the decision is a boon to motorists, it's not a get-out-of-jail-free card for Rodriguez. The evidence derived from the drug dog search has been thrown out, but his case remanded to the lower courts, prosecutors will still have a chance to try to prove there was other reasonable suspicion to think he was carrying drugs. Drug Czar Nominee Says DC Should Be Able to Legalize Marijuana. Acting director of the Office of National Drug Control Policy (ONDCP -- the drug czar's office) Michael Botticelli has said that the District of Columbia should be able to determine its own marijuana policy. "As a resident of the District I might not agree about legalization," Botticelli said, "but I do agree with our own ability to spend our own money the way that we want to do that." Federal law requires the drug czar to oppose marijuana legalization, but that didn't stop Botticelli from endorsing home rule for the District even if that meant legalization. DC Council Cancels Hearing on Taxation and Regulation Bill in Face of Legal Threats. The DC council was supposed to hold hearing on a taxation and regulation bill today, but abandoned those plans after the District attorney general warned lawmakers they and their staffs could face fines or even jail time if they went ahead. Incoming DC Attorney General Karl Racine warned the council in a letter late last week that holding the hearing would violate a congressionally imposed spending restriction prohibiting the city from moving forward on legalization and regulation. Council members and invited witnesses, some of whom had traveled hundreds of miles to testify, instead held an informal roundtable discussion on the topic to avoid the risk of being found in contempt of Congress. Idahoans Not Ready to Legalize Marijuana, Poll Finds. An Idaho Politics Weekly poll found that only 33% supported legalization, with 64% opposed -- and they mean it. More than half (53%) of respondents were "strongly opposed," while another 11% were "somewhat opposed." Only 17% said they "strongly supported" legalization, with another 16% "somewhat supporting" it. Kansas Bill Would Cut Marijuana Sentences. The Kansas Sentencing Commission is pushing a bill through the legislature that would end prison sentences for the first two marijuana possession offenses and allow for increased use of good-time sentence reductions. The bill has been endorsed by the Department of Corrections and many legislators and has passed out of the House Corrections and Juvenile Justice Committee. Montana Food Stamp Drug Testing Bill Passes House. The House last Friday approved House Bill 200, which would require applicants for the Temporary Assistance to Needy Families (TANF) program to be screened for possible drug use. Those deemed to be suspected of drug use after screening would be subjected to drug tests. Tennessee Welfare Drug Testing Scheme Yields Few Positives. Six months after the state rolled out its controversial law to drug test some people applying for public benefits, the first results are in, and they're not very impressive. Some 16,017 people applied for the Families First cash assistance program; only 279 were deemed to have provided reasonable suspicion that they were drug users, and only 37 of them tested positive for drugs. Eight people were disqualified for refusing to answer the drug questionnaire; another 81 were denied benefits after dropping out of the application process. NHTSA Says No Evidence Marijuana Use Increases Crash Risk. A study from the National Highway Traffic Safety Administration (NHTSA) released last Friday found no evidence marijuana use increases the risk of getting in a traffic accident. While pot smokers are 25% more likely to be involved in a crash than non-users, NHTSA attributed that to factors other than marijuana use itself -- particularly that younger men are more likely to get in crashes. "Other factors, such as age and gender, appear to account for the increased crash risk among marijuana users," the study found. The study is the National Roadside Survey of Alcohol and Drug Use By Drivers. Utah Town Pays Big for 2012 Drug War Killing of Danielle Willard. The city of West Valley City, Utah, will pay $1.425 million to the family of Danielle Willard to settle their wrongful death lawsuit against the city and two police officers. 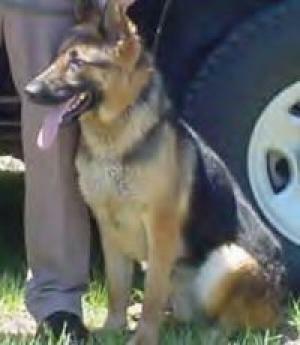 Willard was shot and killed by Det. Shaun Cowley as she sat in her car in an apartment complex parking lot. When detectives approached her vehicle, she began to back up. Two opened fire, but only Cowley was on target, hitting her in the head and killing her. Salt Lake County DA Sim Gill found the shooting unjustified, but a district court judge threw out charges against Cowley. Cowley was later fired for mishandling evidence and dereliction of duty, and the West Valley Vice Narcotics Unit was disbanded. It has just been reconstituted. Missouri Activists Issue Report on Drug Task Force Misconduct. Show Me Cannabis has released a comprehensive report on misconduct in the state's anti-drug task forces. The report is "Drug Task Forces in Missouri: Secret, Dangerous, and Unaccountable; A Thorough Exploration of Patterns of Gross Misconduct." 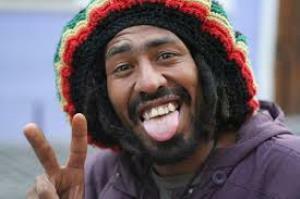 Jamaican Senate Approves Ganja Decriminalization. The Senate approved marijuana decriminalization last Friday after five hours of debate. Up to two ounces will be decriminalized, Rastafarians will be able to grow their own, and the country will begin to move toward setting up a legal marijuana industry. The measure must still pass the lower House, but is expected to do so. Vancouver Looks to Regulate Marijuana Dispensaries. Even though they are illegal under Canadian law, at least 60 dispensaries operate in Vancouver, and the municipal government is now moving to come up with a way to regulate them -- not shut them down. Click on the link for more details. Arcview sees legalization in 18 states by 2020. 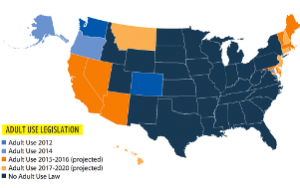 ArcView Group Predicts 18 States Will Legalize By 2020. ArcView Market Research, a firm that pairs investors with marijuana-related businesses, is predicting that 18 states will have legalized marijuana by the end of 2020. Those states are: Arizona, California, Massachusetts, Maine, Nevada, Rhode Island, and Vermont by 2016; Connecticut, Delaware, Maryland, Montana, New Hampshire, and New Jersey by 2020. Alaska, Colorado, Oregon, and Washington have already legalized it, as has the District of Columbia. Southern California Legalization Meetings Planned. The California Coalition for Cannabis Policy Reform, which is working to create a unified movement behind a legalization initiative in 2016, will be holding a series of meetings in Southern California this weekend. There will be events in West Hollywood, Riverside, San Diego, and Santa Ana. They want people to RSVP. Click on the link for meeting details. Full-Blown Medical Marijuana Bill Filed in Florida. State Sen. Jeff Brandes (R-St. Petersburg) has filed Senate Bill 258, which would regulate the cultivation, distribution, and use of medical marijuana in the state. The proposal larger mirrors that failed constitutional amendment that won 57% of the vote last year (it needed 60% to pass because it was a constitutional amendment). The state passed a medical marijuana bill last year, but it was limited to high-CBD cannabis oils. Brandes is chair of the Senate Transportation Committee and sits on the Criminal Justice Committee, too. Medical Marijuana Bill Reintroduced in Pennsylvania. State Sens. Daylin Leach (D-Montgomery) and Mike Folmer (R-Dauphin) have reintroduced a medical marijuana that died late in the last session. The new bill, Senate Bill 3, is almost identical to last year's Senate Bill 1182. It has a bipartisan batch of cosponsors -- 11 Republicans and 14 Democrats. Iowa Medical Cannabis Oil Registrations Now Open. The Department of Health has completed establishing a process to approve and generate medical cannabis oil registration cards. The legislature passed a bill last year allowing for such use. The relevant Health Department web page is here. Federal Hemp Bill Filed. Rep. Thomas Massie (R-KY) has filed HR 525, which would amend the Controlled Substances Act to exclude industrial hemp from the definition of marijuana. The bill has 47 cosponsors -- 31 Democrats and 16 Republicans. It's been assigned to the House Judiciary and House Energy and Commerce committees. Federal Civil Asset Forfeiture Reform Bill Filed. Sen. Rand Paul (R-KY) has reintroduced the Fifth Amendment Integrity Restoration (FAIR) Act, SB 255. The measure would end the federal government's Equitable Sharing program for civil asset forfeiture. An identical measure has been introduced in the House. The bills are headed for each house's respective judiciary committees. DEA is Spying on Millions of Vehicles. A license plate tracking program run by the DEA is building a national database that tracks the movement of vehicles around the US. The secret domestic intelligence-gathering program has scanned and stored hundreds of millions of records about motorists, all without a warrant. The DEA's uses of license plate readers on a massive scale "raises significant privacy concerns," said Sen. Patrick Leahy, senior Democrat on the Senate Judiciary Committee. "The fact that this intrusive technology is potentially being used to expand the reach of the government's asset-forfeiture efforts is of even greater concern." There's much more at the link. Maine Legalization Foes Get Organized. Maine isn't going to legalize weed without a fight. Two groups with "grave concerns" about legalization kicked off a year-long campaign to "educate" Mainers about the dangers of the herb. The two groups are Smart Approaches to Marijuana Maine and the Maine Alliance to Prevent Substance Abuse. The move comes as Rep. Diane Russell (D-Portland) said she will reintroduce her perennial legalization bill, and as state activists work toward a legalization initiative in 2016. 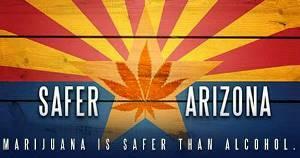 Arizonans Rally to Protest Pot Prohibition, Call for Legalization. More than a hundred people gathered outside the state capitol in Phoenix Monday to urge marijuana law reforms. They were led by Safer Arizona, which says it will protest on the first day of the legislative session until marijuana is legal. A legalization bill will be before the legislature this year. Fight Over Georgia CBD Medical Marijuana Bill.Rep. Allen Peake (R-Macon) has said he will modify his CBD medical marijuana bill, House Bill 1, after Gov. Nathan Deal (R) objected to a provision that would allow production of the crop in the state. That has supporters of the bill unhappy. They say that because federal law prohibits transporting medical marijuana between states, their medicine will remain out of reach if it cannot be grown in-state. Federal Hemp Bill Reintroduced. Oregon Sens. Ron Wyden (D) and Jeff Merkley (D) and Kentucky Sens. Mitch McConnell (R) and Rand Paul (R) have re-filed their bill to amend the Controlled Substances Act to exclude industrial hemp from the definition of marijuana. The bill, SB 134, has been referred to the Senate Judiciary Committee. 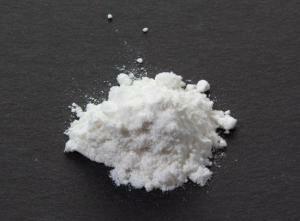 Heroin Overdose Deaths Jumped in 2013. The Centers for Disease Control and Prevention released data Monday showing that 8,257 people died of heroin-related deaths in 2013, up 39% from the 5,924 deaths the previous year. The number of overall drug overdose deaths also increased, to 43,982 in 2013 from 41,340 the year before. That's an overall increase of 6%. First LSD Study in Decades Shows Promising Results. LSD can alleviate anxiety in terminally ill patients, according to the first clinical study of the drug in 40 years. The research was sponsored by the Multidisciplinary Associations for Psychedelic Studies (MAPS). The research results were published here. Houston Congresswoman Files Trio of Criminal Justice Reform Bills. Rep. Sheila Jackson Lee (D-TX) has filed several criminal justice reform bills: HR 46 would increase the evidentiary standard required to convict someone for a drug offense and require screening of police participating in drug task forces; HR 51 would provide for collection of data on racial profiling in traffic stops; and HR 71 would provide earlier releases for certain nonviolent offenders. Federal Medical Marijuana Asset Forfeiture Reform Bill Filed. Rep. Barbara Lee (D-CA) has filed HR 262, which would amend the Controlled Substances Act to exempt from civil forfeiture real property seized because of medical marijuana-related conduct in states where it is legal. The bill currently has no cosponsors. Wisconsin Group Delivers Urine Specimen Cups to Legislators in Welfare Drug Test Protest. The Wisconsin chapter of the National Organization for Women (NOW) protested Gov. Scott Walker's (R) plan to impose drug testing on welfare recipients Monday by delivering urine sample cups -- unused -- to the offices of Republican legislators. The group says the plan won't achieve anything except demonizing the poor and that it may be unconstitutional. Mexican Drug Traffickers Switching to Meth and Heroin. Marijuana legalization and decriminalization north of the border is having an impact south of the border, if US drug seizures are any indication. The amount of marijuana seized by state, local, and federal law enforcement has dropped 37% since 2011, while heroin seizures have increased three-fold and meth seizures have increased five-fold. 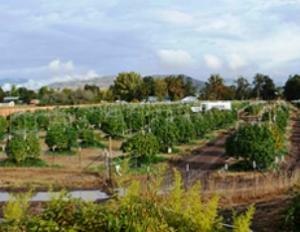 Farmers in Mexico have reported switching from marijuana to opium in response to market trends. Drug Use Survey Finds Teen Marijuana Use Declining Even as States Legalize. The annual Monitoring the Future survey of teen habits is out today, and it finds that legalization has not sparked an increase in teen pot smoking. The survey found that 24% of eighth, 10th, and 12th graders reported past use marijuana last, down from 26% the year before. And among 12th graders, the number who reported daily use also declined from 6.5% last year to 5.8% this year. There's much more to the survey; click the survey link to see it. Iowans Organize to Push for More Effective Medical Marijuana Law. The legislature this year passed a bill allowing for the use of low-THC cannabis oil to treat people with epilepsy, but that's not good enough for a new group, Iowans 4 Medical Cannabis. The group today announced it had formed to push legislators to make it possible to produce and dispense medical marijuana. Omnibus Spending Bill Cut Funds for NHTSA Roadside Drug Use Surveys. The $1.1 trillion spending bill that has gotten so much attention over its marijuana provisions also bars the National Highway Traffic Safety Administration (NHTSA) from using funds to complete its "National Roadside Survey." It was a voluntary survey that only collected data from people willing to participate, but came under congressional criticism after a Texas TV station aired a program about a Fort Worth checkpoint where police ordered motorists off the road at random to collect samples. Federal Bill Filed to Increase Reporting of Deadly Force by Police. Rep. Steve Cohen (D-TN) has filed HR 5866, which would "require the Attorney General to issue rules pertaining to the collection and compilation of data on the use of deadly force by law enforcement officers." The bill next was not available at press time. The bill has five cosponsors -- all Democrats -- and has been referred to the House Judiciary Committee. WorkForce West Virginia Drug Testing Doesn't Find Many Dopers. In its annual report to the legislature, WorkForce West Virginia, the state's employment services program, reported that it had subjected 1,205 people to drug testing upon their seeking tuition reimbursement for employment training programs. Only 1% of them failed. No word on the cost of drug testing all those people. Mexican Federal Police Accused of Collaborating With Local Cops in Case of Missing Student Teachers. In an article published over the weekend, the respected Mexican political weekly Proceso reported that federal police worked together with Iguala police in the September attack on teachers' college students that left 43 missing and presumed dead and which has sparked protests across the country. Proceso also reported that federal police likely tortured key witnesses whose testimony was critical in the federal attorney general's investigation of the case. "We have information that proves the federal government knew what was happening in the moment it was happening, and participated in it," Anabel Hernández, the lead reporter for the Proceso piece, said in an interview. "The government has tried to hide this information." There's much more at the link. Armed Civilians Block Western Mexico Highways Seeking Crackdown on Cartels, But… Hundreds of armed men blocked highways around nine cities in the Western state of Michoacan over the weekend as a means of pressuring the government to crack down on the Knights Templar cartel. They unfurled banners calling for the arrest of cartel leaders. But at least some of the armed men were identified as members of Los Viagras, a group of gunmen who had once served as the Knights Templar's armed wing and who are now trying to displace them from the drug trade in the state. Canadian Federal Government Loses Again in Bid to Block Home Medical Marijuana Cultivation. Health Canada earlier this year issued new medical marijuana rules that prohibited home growing and shifted production to commercial operations, but it has so far been blocked by the courts from implementing them, and now it has been blocked again. Patients won an injunction earlier this year to allow them to continue growing their own. Health Canada appealed that decision, but the Federal Court of Appeal has now upheld the injunction. 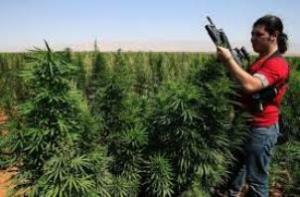 Druze Leader Walid Jumblatt Calls Again for Legal Hash in Lebanon. Veteran Lebanese power-broker Walid Jumblatt, leader of the Druze community, has renewed his call for legal hash production. "It's time to allow hash to be grown and to overturn arrest warrants against people sought for doing so," wrote in Arabic on his Twitter feed. He expanded his comments in an interview with Al-Jadeed TV. "Never in my life have I smoked marijuana, but I support growing cannabis for medical use and to improve the living conditions of farmers in north Lebanon and the Bekaa Valley. Let's legalize cannabis and regulate its cultivation." New Maine Legalization Group Wants Home Grows, Social Clubs. Calling itself Legalize Maine, a new group has emerged with a plan to free the weed there. Group organizer Paul McCarrier said his plan is "home grown" -- a jab at the Washington, DC-based Marijuana Policy Project (MPP), which has been laying the groundwork for statewide legalization there for the past several years -- and would allow for home cultivation, the use of marijuana in social clubs, and an 8% tax on sales. MPP has not released details of what it will propose for the 2016 ballot, but its local initiatives in the state did not address home cultivation or allow for social clubs. Click on the link to read more detail on the Legalize Maine plan. Iowa Pharmacy Board Punts on Reclassification. The Board has decided to defer a decision on whether to reclassify marijuana from Schedule I to Schedule II under state law until its January meeting. The Board could have decided at its Wednesday meeting to recommend to the legislature that marijuana be rescheduled after a public hearing Monday, but while it said marijuana does have medical use, it also worried that it has high abuse potential. The board was (in)acting on a petition from Des Moines medical marijuana activist Carl Olsen. Nevada Will Honor Medical Marijuana Cards from Other States. Once dispensaries begin to open in the state next year, people holding medical marijuana recommendations from other states will be able to purchase marijuana there. Civil Asset Forfeiture Should "Go Away," Says USA Today. USA Today has joined the growing ranks of newspapers calling for state and federal civil asset forfeiture reform. In a Wednesday editorial, the country's third-largest daily circulation newspaper said asset forfeiture had come "unmoored" from its original intent of taking the profit out of crime and now appeared like something "one might expect in a banana republic, not the United States." The newspaper called for action on pending federal asset forfeiture reform bills and ended its editorial thusly: "Civil asset forfeiture is government at its absolute worst -- intimidating helpless citizens for its own benefit. It needs to go away." New York Times Examines ATF Fake Drug Stash House Rip-Off Stings. The Times turns a jaundiced eye to the Bureau of Alcohol, Tobacco and Firearms' (ATF) use of imaginary stash-house stings, where undercover agents entice people into participating in what they thought were robberies of drug stash houses, only to be arrested and imprisoned, sometimes for decades. The newspaper notes that although most of the stings have survived legal challenges, some federal judges are now throwing out such cases. One federal judge in Los Angeles threw out a case earlier this year, citing "outrageous government misconduct" with the ATF "trawling for crooks in seedy, poverty-ridden areas -- all without an iota of suspicion that any particular person has committed similar conduct in the past." Almost all of the people wrapped up in the stings have been brown or black. Clarence Walker has covered this issue for the Chronicle here and here. Argentina As Latin America's Newest Drug Trafficking Hub. Argentina is emerging as a new drug trafficking hub, according to this analysis in World Politics Review. Author Benoit Gomis points to a number of factors ranging from geography to the size of the Argentine drug market, as well as infiltration by regional drug operations, weak law enforcement, and corruption. Gomis suggests one thing Argentina can do is emulate its neighbor Uruguay, which legalized marijuana last year in a bid to undercut the drug trade. Click on the link to read the whole thing. Nevada 2016 Legalization Initiative Ready to Hand in Signatures. The Nevada Coalition to Regulate Marijuana says it will turn in 170,000 signatures Wednesday for its proposed 2016 initiative to legalize marijuana. It needs 102,000 valid voter signatures to qualify for the ballot. This is a Marijuana Policy Project effort. Oregon Prosecutors to Rethink Pending Pot Cases. Although marijuana possession won't be legal in the state until July 2015, prosecutors in some of its most populous counties say they will revisit pending marijuana cases in light of last week's legalization victory at the polls. DAs in Clackamas (Oregon City), Multnomah (Portland), and Washington (Hillsboro) counties all said they are trying to figure out how to proceed. Rhode Island Activists Aim to Legalize It in 2015. Which will be the first Northeastern state to legalize marijuana? 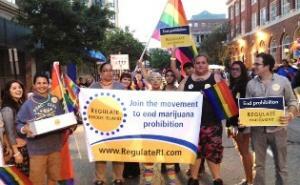 Rhode Island activists organized into Regulate Rhode Island want their state to be the one. They are putting together a coalition to try to push a bill to tax and regulate marijuana through the General Assembly next year. The bill died in the legislature this year. This is a Marijuana Policy Project effort. NYPD to Stop Arrests for Minor Marijuana Offenses. The NYPD and Mayor Bill de Blasio (D) announced today that the department will quit arresting people for low-level marijuana possession. NYPD has been arresting tens of thousands of people each year, but in the face of withering criticism, it will now begin issuing tickets instead. But people caught smoking pot in public will continue to face arrest. Wisconsin Governor Calls for Drug Testing for Unemployment, Food Stamps. Newly reelected Republican Gov. Scott Walker is calling drug testing of people seeking public benefits, including unemployment insurance. He and Assembly Speaker Robin Vos (R-Rochester) both say it will be a priority in the coming legislative session. Walker and Vos haven't unveiled an actual proposal, but any bill that calls for mandatory, suspicionless drug testing is certain to face constitutional challenges. Pot Arrests Drop, But Still 1.5 Million Drug Arrests Last Year. More than 1.5 million people were arrested for drug offenses in the US last year, and more than 693,000 of those for marijuana offenses. The figures come from the FBI's 2013 Uniform Crime Report, which was released today. Marijuana arrests have declined from peaks early in this century. In 2008, there were a record 872,000 marijuana arrests, so pot busts have declined by slightly more than 20% since then. But arrests for other drug offenses continue apace, actually increasingly slightly last year. Still, because of the decline in marijuana arrests, the overall number of drug arrests dropped by about 50,000. ACLU Gets $50 Million to Fight to Reduce Incarceration. The American Civil Liberties Union (ACLU) has been awarded a $50 million grant from George Soros's Open Society Foundations to mount an eight-year campaign to change criminal justice policies and reduce incarceration in this country. The group says there is an emerging bipartisan consensus to make reforms, although last week's election results may stiffen opposition. The ACLU wants to reduce imprisonment by 50% in the next years. Missing Mexican Students Were Murdered By Drug Gang, Officials Say. Mexican Attorney General Jesus Murillo Karam said last Friday that 43 radical student teachers missing for more than a month in Iguala, Guerrero, had been murdered by a drug gang working with the wife of the mayor of the city. Murillo said the students were killed and their bodies burned, with the remains scattered in a local river. The announcement of the students' fate has not, however, quieted outrage in the country, where corruption and impunity are major issues. Demonstrators torched the wooden front doors of the National Palace in Mexico City Saturday night and were blocking the Acapulco airport Monday, among other actions. Former Chilean President Calls for Drug Decriminalization. In an interview last Friday, former President Ricardo Lagos said decriminalizing marijuana -- and possibly even cocaine -- possession was the best way to reduce both prohibition-related crime and drug use. Start with marijuana, he said. "After one or two years we will see if we dare to legalize cocaine. It starts with a major prevention campaign and with providing non-prison punishment for those who are incarcerated today, depending on the magnitude of their offenses," Lagos proposed. "The only thing that's clear to me is that there were 10,000 drug arrests per year in Chile in 2002 and 10 years later it's multiplying by eight, reaching 82,000. Chile needs to grow up," he said. Lagos was president of the country from 2000 to 2006. In Historic Move, British Parliament to Debate Drug Policy. The House of Commons will debate Britain's drug policies for three hours this coming Thursday. It is the first time Parliament has taken up the topic since passage of the Misuse of Drugs Act -- the current law -- four decades ago. The debate comes as Britain's governing coalition has been sundered on the issue, with the junior partner Liberal Democrats coming out loudly for drug decriminalization and the senior partner Conservatives firmly holding the line against any reforms. Australia's New South Wales Wants Random Drug Testing of Drivers. The New South Wales state government has introduced a bill that would allow police to randomly drug test drivers for the presence of marijuana, amphetamines, and ecstasy. The tests would be done with a saliva swab.